I'm telling you, little things can really make a difference. For years I've been using an ancient (I'm guessing late 1970s? early 1980s?) 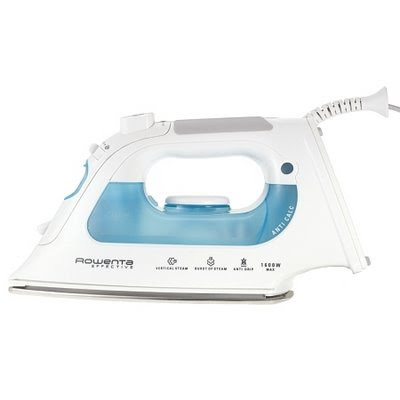 Black & Decker iron. I think I got it at a garage sale or inherited it or maybe it was just living at a house I moved into, ten years ago or so. It doesn't work that well. It takes forever to heat up, and rather than steaming, it spits brown rusty water onto my fabric. But actually, this didn't bother me that much - it gets hot eventually, and that's all I really need (I sprayed water on things occasionally when I wanted some steam, which incidentally is how women did "steam" back when irons were made of iron, and were heated up on the woodstove). An aside: I do like to buy new things now and then (ha ha), but I must say, in the world of sewing, old equipment has always served me very well. My sewing machine (a 1970s Singer) is probably older than I am, has been with me for at least a decade, and is wonderfully indestructible. I'm loyal to some of my old stuff. But the real problem with my iron is that it doesn't turn off unless you unplug it. You can't even turn it off on the handle - all I can imagine is that this iron predates our current litigious society. Now, irons that stay on are usually considered a positive thing for sewers, because we tend to be up and down to our ironing boards between bouts of sewing. Committed quilters and sewers do not want to have to turn the iron on every time they need to press a seam. Many a seamstress swears by her ancient, pre-safety-mechanisms iron. This is predicated on the assumption that our dogs and us would survive the fire and be able to file said claim. As Steve said, it'd be nice to know in advance if I was planning to burn the house down and collect the insurance money,* so that he could be sure to be out of the house running some errands at that time. Really, it's only polite to inform your housemates of any such plans. Enter my new Rowenta Iron! It steams! It does not spit rust! It turns itself off! Even better, it turns itself off very quickly if knocked over! (I have also found it turns itself back on and gets hot pretty darn quickly, so the inconvenience of having to turn it back on every time I stand up to press a seam is minimal.) It wasn't particularly expensive, and judging by my iron-ownership history, it should last me at least 20 years. *Note to Farmers Insurance Group: I'm not. Thanks, Inder! I was having trouble falling asleep! Funnily enough, I will also sleep better at night thanks to this post! Coming soon on Inder's fire safety blog - 9 V batteries. OMG. I totally bought the same iron this weekend. I'd had it with my clunky old iron that was leaving Calcium Deposits all over my beautiful creations. yea for Self Cleaning Anti Calcium irons! An even more pregnant Inder models a new apron. A very pregnant Inder makes a hippy top.